We have created two handy Mouse Control Kits, containing 0.0025% w/w difenacoum, for use indoors or outdoors (around buildings only). Select which kit you require depending on the extent of the infestation you may have. 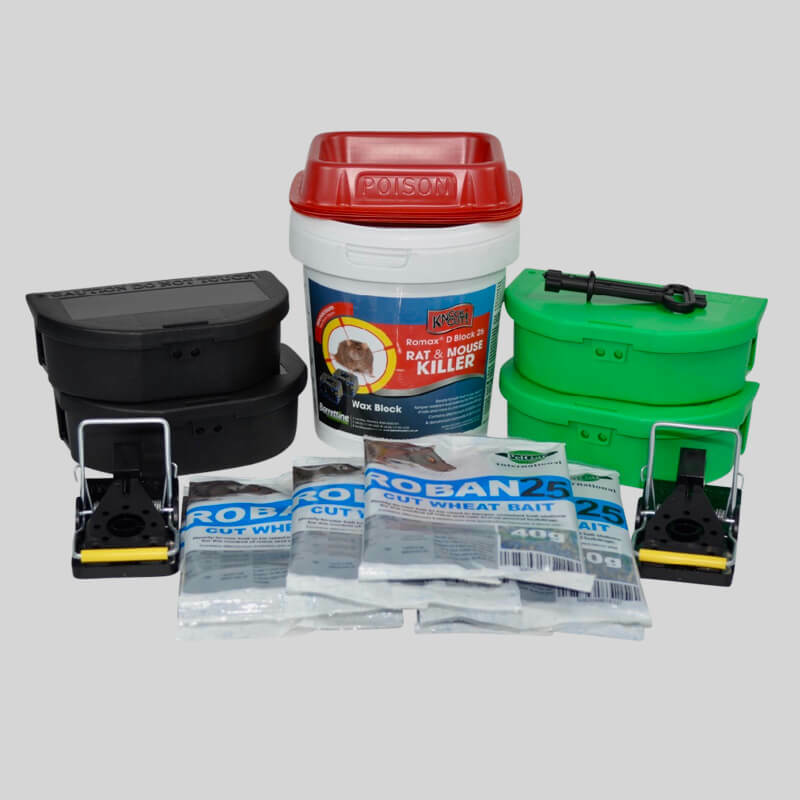 Each kit consist of multiple sachets of Roban 25 Cut Wheat grain bait each containing 40g, one or more tubs of Knockout Romax D Block Bait, each containing 15 blocks, plus a selection of mouse bait boxes, traps and open bait trays. The bait boxes should be placed in secure positions frequented by mice, away from any non-target species. The bait may be kept as sachets or opened and used in the open bait trays. We also include gloves, and a disposal bag for the hygienic disposal of any dead mice. Read our facts and tips on how to use these kits. Traps should be placed at right-angles to the direction of rodent travel, the treadle end of the trap being placed across the rodent run, against a vertical surface. Baits or attractants can increase catch rates if placed on the treadle. Traps should also be placed so as to avoid trapping non-target species. Bear in mind that animals become trap shy with prolonged use and that the absence of trapped animals does not necessarily confirm the absence of rodents. Open bait trays should be placed in secure, covered positions where non-target species (birds, hedgehogs, dogs, cats and children) cannot access them, whilst the locked bait boxes may be discreetly placed in more exposed but equally secure positions. Mice eat little and often so to be effective a large number of baiting points should be used. Use bait points of 20-30g, 5m apart, reducing to 2m in heavy infestation. The active ingredient is 0.0025% w/w difenacoum.